Nestled in a quiet street among other quality properties, this well proportioned house will meet all your needs especially if extra garaging is a requirement. It offers four double bedrooms, the main with ensuite and WIR, a very well appointed kitchen with open plan living/dining which flows out to a covered barbecue patio with a modern Archgola providing sun and shelter. Adjacent to the living room and accessed by double doors is an equally spacious second lounge with North facing bifold doors. This gives a superb connection to the outdoor areas which are nicely landscaped and fully fenced giving privacy and security for children and pets. The kitchen has an abundance of pantry & storage space. The central Island unit, which has the sink and dishwasher, has a breakfast bar providing seating for casual dining. There are many extras: pellet fire in the living room, heat pump in main hallway, wired for sound in the lounge, high speed broadband, garden shed, reflective glass windows and woodgrain vinyl planking on floors in kitchen and bathrooms. 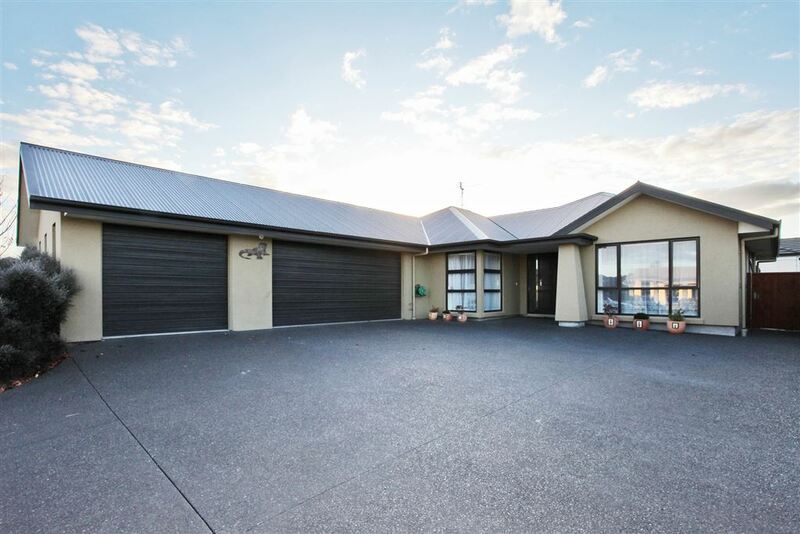 The large three car garaging has two auto doors, work bench and a loft with ladder access making for a perfect man cave - with room for all the toys. Due to work commitments, this family is on the move. Their loss is your gain. This home is well worth viewing, you will be impressed!